I’ve been developing software for different incarnations of the Oracle Application Server in the past (Oracle OC4J 10g R3 and BEA/Oracle WebLogic (v8.1 and v10.3), but it’s been quite a while since my last encounter with the server. During recent years I’ve been involved mostly with other application servers. Despite occasional hiccups, I had been reasonably satisfied with the server, so I was curious to give the latest version of Oracle’s application server a quick test drive. Having a background in software development, I thought I’d approach this first from a developer perspective, checking out how the application development workflow (including code, build, deploy) feels like with the latest version. Obviously, much of the workflow is actually about generic Java EE development (as opposed to app server specific development) as long as you adhere to the standard, but I’ve felt that trying simulate the development workflow gives you a more complete view of what it’s like to work with a particular app server product. Instead of coding a Java EE app myself or porting an existing one, I thought I’d work with sample applications made available by others. There are several options for getting WebLogic running for development purposes: a) use Oracle JDeveloper and the embedded WLS server b) use the IDE of your choice and the WLS zip distribution c) use the IDE of your choice and the full WLS. Since the focus of my test was to check out WLS for development purposes (but not JDeveloper), I chose option b. The first distribution includes the application server itself and weighs approximately 184 MB. The second one includes sample code. The installation process is pretty well documented in the WLS package README files but there were a few small gotchas, though. The supplemental zip distribution also includes a nice set of documentation, including architecture description, for the samples in found in $MW_HOME/wlserver/samples/server/index.html. We’ll skip WLS domain creation for now, because the samples setup script creates one for us, and start up and move straight to installing the WLS supplemental distribution. # create WLS domain, server, database etc. If you have a GUI session with your OS, a web browser should open up with the sample application page. Oracle provides a WLS supplemental zip distribution aimed at development use. The supplement includes code samples demonstrating various aspects of using different Java EE technologies. It also includes a complete Java EE v5.0 (why not v6.0?) sample application called Avitek Medical Records or MedRec. It claims to “showcase the use of each Java EE component, and illustrates best practice design patterns for component interaction and client development“. After I got the application server and sample application up and running I wanted to start browsing the application source code and see how to make modification. select project / properties / server or targeted runtimes and choose “Oracle WebLogic Server 12c”. Uncheck WebLogic 10.3 version. The Pet Catalog is a Java EE 6 sample application that demonstrates usage of JavaServer Faces 2.0 and the Java Persistence API. It’s based on a three-tiered architecture on a logical level, but both the presentation and logic tier components are packaged in a single WAR module. With the first sample app, we were able to skip creating a WLS domain because the installation script created one for us, but now we’ll have to create one. In WLS, the concept of a domain refers to a logically related group of WLS servers and/or server clusters that are managed as a unit. Each domain has an administration server, which is used to configure, manage and monitor other servers and resources in that domain. Additional servers in the domain are called managed servers, which are used for deploying and executing Java EE artifacts. The administration server is meant to be used only for administration, though you can deploy applications to it in development installations. Java’s “Write once, run anywhere” is a great value proposition, but especially in Java EE space delivering on that proposition has been lacking. Portability issues arose also in this case, when I tried deploying to WLS the Pet Catalog app, that apparently had been tested mostly on GlassFish. The actual issue seemed to be related more with the particular JPA implementation (EclipseLink) than standard JPA, but I think it’s telling evidence of portability issues since this is supposed to be a standard Java EE showcase sample application. Once, I managed to find out what was causing the issue, fixing it was simple. Often application servers have their own, sometimes very unintuitive, ways of reporting issues and troubleshooting is an area where experience in your particular application server product can really make a big difference. Also, often with well-architected applications, it’s the packaging and deployment where portability problems typically arise, instead of the actual code. In this case I ran into a problem with datasource authentication. To fix the deployment issue I had to modify the persistence unit definition in persistence.xml by commenting out eclipselink.jdbc.user and eclipselink.jdbc.password parameters. Pet Catalog uses a MySQL database for persisting data. A database, tables and a user account must be created before deploying the application. Finally, deploy the application WAR to WLS. The application should run without customizing any deployment parameters. In my quick test drive I focused mostly on the development workflow related aspects of the WebLogic server (developer distribution), and not operational aspects such as scalability, availability, reliability, operability etc. WLS appears to be a capable, feature rich Java EE application server, as could be expected from a major vendor, but the zip distribution was also relatively light-weight and ran quite well on my laptop. WLS has very nice server administration capabilities: you can easily view and edit the configuration using command line tools, but a comprehensive web-based administration console is also available that allows you to perform any server administration task. The server configuration is persisted in XML files (e.g. config.xml) that are stored under a single filesystem directory tree, which makes it easy to compare and migrate configuration files. The console just enables administrators to manipulate these configuration files through a web UI. 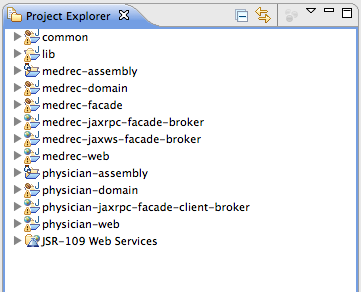 The web console has a much more comprehensive feature set than e.g. the one in Jboss EAP 5. WebLogic also features a command-line scripting environment (WLST) that you can use to create, manage, and monitor WLS domains. Due to XML based configuration and scripting support backup and recovery of server configuration, as well as taking snapshots and rolling back changes should be easy. Deploying the exact same configuration should be simple as well. It seems odd that the sample application doesn’t showcase all the new features of the latest-and-greatest Java EE specification version that the WebLogic server supports. Also, the basic development mode installation could’ve been made simpler still, similar to some other app servers where you only need to do a simple unzip. Production installation is of course an entirely different story. Old-school bulk file transfers may be considered out of fashion in a SOA world, but we’re not in a perfectly SOA enabled world, yet. So, bulk file transfers still remain widely used and SFTP is the workhorse of bulk file transfers. You can see the session start, source IP address and user account info there. This is enough information for basic transfer account activity monitoring, and in some cases it may be enough for accounting and billing as well. MSG_SESSION_START="user $LOGNAME session start from $SOURCE_IP"
logger -p local5.notice -t sftpd-wrapper -i "$MSG_SESSION_START"
So, now you can customize the messages and perform pre/post session actions. If you need to do more advanced reporting for this data or allow non-technical users to do ad-hoc reporting, you might want to put the session data in a RDBMS. You could either add the data to the database directly in the wrapper script or set up logrotate to rotate your custom log files and configure a postrotate/prerotate script that would parse the log file and add entries to the database in batches. Sep 16 16:07:40 localhost sftp-server: opendir "/home/sftp1"
Sep 16 16:07:40 localhost sftp-server: closedir "/home/sftp1"
The log entry format requires some effort to process programmatically, but its still manageable. You can identify SFTP session operations, such as individual file transfers from the log. The log could then be processed using a logrotate postrotate/prerotate script that could e.g. add the data in a database for generating input data for accounting or billing. Software versions: RHEL 6.3 and OpenSSH 5.3.